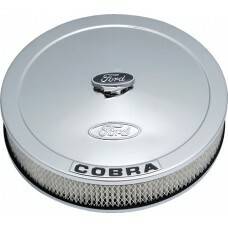 Ford COBRA chrome air cleaner assembly. 13” diameter (1” smaller than most popular air cleaner units) allows greater clearance on distributors. 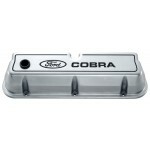 Supplied with Ford logo air cleaner nut. Fits 5 1/8” neck carburettors e.g. Edelbrock Performer Series, Holley.